Our summer cottage overlooks an acre of meadowland which slopes down to the shore of a small lake in a series of natural terraces, a legacy from the ice age. The meadow is like a valley protected on both sides by tall, old trees: pines, firs, silver birches and oaks. By the lake a 25-foot high outcrop of granite, worn smooth by the ice and now covered in moss, provides a natural boundary. 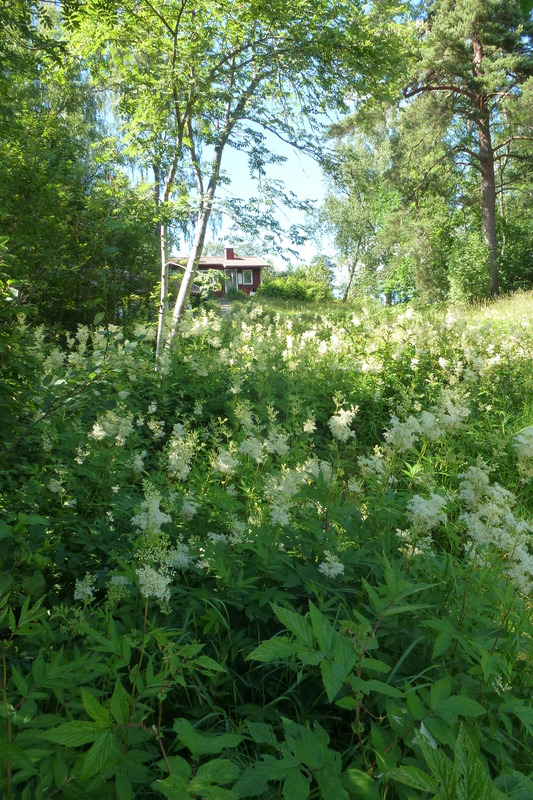 In summer an almost impenetrable jungle of grasses, ferns, wild flowers, bushes heavy with roses and currants and small saplings blankets the meadow. A few narrow paths which follow the contours of the terrain make it easier to move around in this undergrowth. They were originally made by the local badgers on their nocturnal excursions. We follow them too. Rain and sunshine before midsummer lead to an explosion of green vegetation, and the meadowland becomes dense and entangled. The dog, a large boxer, disappears into the grass to find a good place for a snooze. The kids play “spot the dog”. Evenings are devoted to tic-picking, which he doesn’t like. Soon it will be time to harvest the currant bushes, red, white and black, if we can find them before the blackbirds do. The grass needs cutting. For the past 60 years or so this has been done using a scythe. Before that the local farmer’s horses and cows did the job. I inherited the scythe from my father-in-law, 25 years ago. It hangs on a rusty nail in the shed, as though waiting to be used in a horror movie. There was no way back, I had to learn how to use it. Mary had often seen her father in action, so she demonstrated how to swing the scythe. Over the years I have gradually got the hang of it, and in particular avoided any major injuries. First I had to learn how to sharpen the blade using a whetstone. The picture that came to mind was of the butcher using a steel to sharpen his knives. 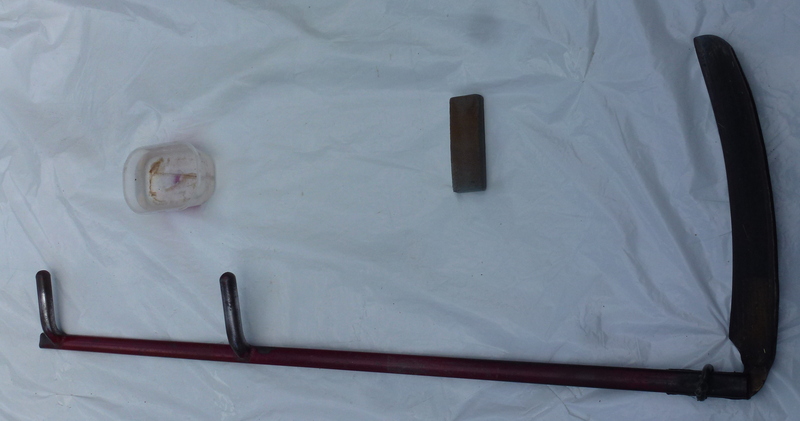 Sharpening a scythe blade is different, stone on steel. The whetstone is a block of stone with fine and rougher grades, and has to be wetted for a good sharp edge. The action is different too – the butcher strokes his knife along the steel, the whetstone is stroked along the scythe blade. Both alternate between the two sides of the blade. To sharpen the blade, I stand with the scythe handle nestling in my armpit, arm extended along the dull side of the blade and other hand sliding the whetstone along the edge in steady strokes. I don’t use gloves but so far I have not cut myself. It is easier to cut grass while still wet with morning dew or when the evening mist rolls in from the lake. We still use the same scythe, but switched to a heavier, shorter blade about ten years ago. Cutting grass with a scythe is quiet; only a slicing sound as the blade cuts through the stems of the grasses and like a scalpel separates the grass from its roots. It is heavy work swinging the scythe from side to side, rhythmically exposing the contours of the land one step at a time. We usually let the grass lie for a few days, to release next year’s seeds and make it easy to rake up the grass. Over the years I have cut down a currant bush or two by mistake, but the dog still has a tail. Swinging a scythe is a sweaty business but physically satisfying, and I tell myself it is good exercise. Often I am too enthusiastic at the beginning of the cutting season, and get a stiff, sore back which turns into a chronic condition as the summer proceeds and more grass is liberated from its roots. “No way, what will happen to the meadow then” I replied, despairingly. “Get a machine, a trimmer. I have one. Perfect. Got it second-hand and share with a neighbour”. To cut the story short, I ordered a machine for cutting grass. 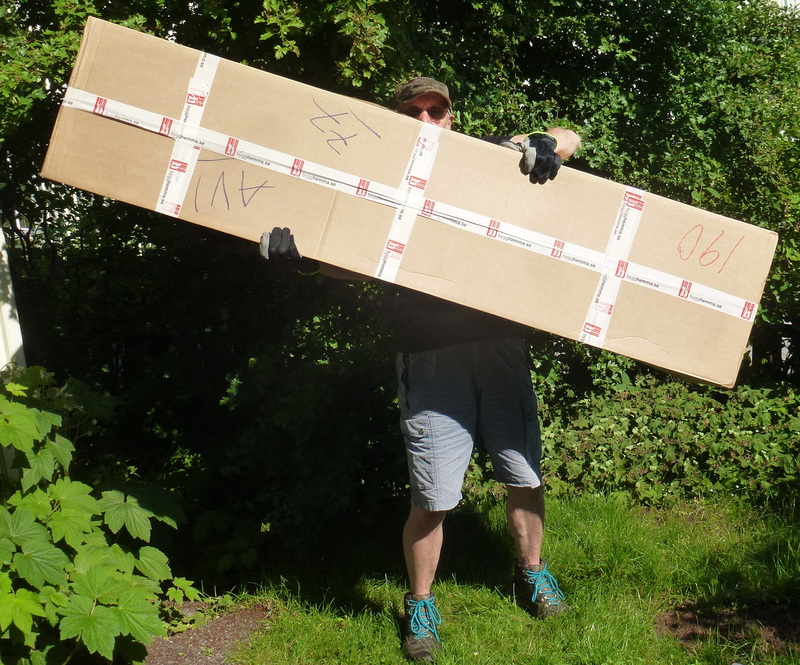 A month later a large, heavy box arrived. It could easily have doubled as a budget coffin. The machine came in several parts which had to be assembled. 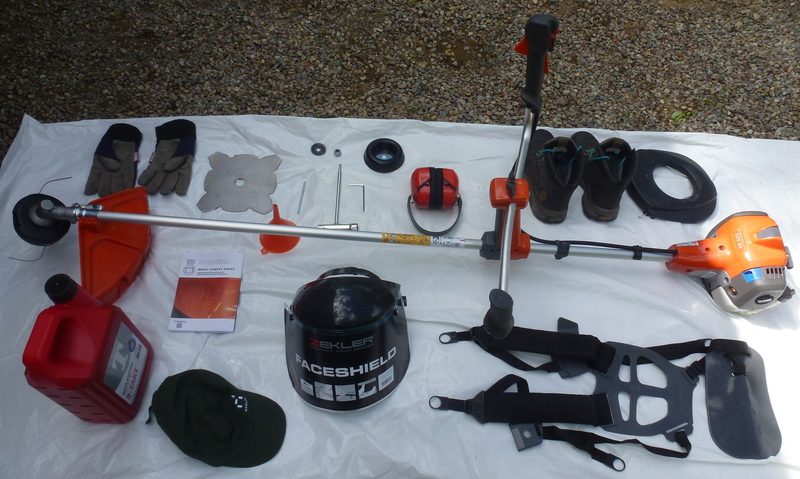 Also included was a 30-page manual (four languages), safety instructions, grass cutter, trimmer head, tool kit, harness, various nuts and bolts. That was not all; the machine demands a special petrol/oil fuel, not included, a funnel, ear mufflers, face shield, heavy boots and thick gloves. I skipped the special grass cutting safety trousers. A couple of days later I had assembled the machine and studied the manual carefully. At least half of the instructions were about safety. Sadly I couldn’t figure out how to start the machine. A safety precaution perhaps? I phoned Customer Service and explained my dilemma. The service technician agreed that the manual was rather unclear, but blamed a poor translation. I didn’t think it advisable to ask what it said in the original language. He said it was one of the easiest models to start on the market and explained the procedure slowly and with a loud, patient voice. Obviously he had been trained to communicate with regular folks. “If you still feel uncertain, there are excellent instruction films on YouTube” he said, with a rather cheerful voice, and hung up. I took his advice and searched YouTube using the model number of the machine. Rather unexpectedly the films which came up were all in Russian. OK, I don’t have anything about Russians, so I clicked on the first film. It was quite entertaining as far as instructional films go: two portly Russian men in shiny shorts and old gym shoes were happily prancing around an overgrown orchard like horses in a circus ring, waving their motorised grass cutters with such abandon that I expected a harvest of toes to crown their performance. They swung their machines about in a very carefree fashion, clearly not having read the extensive safety instructions. Not the reading kind, I guess. Suddenly one of the machines shut down, rudely interrupting their pas-de-deux. The owner’s attempts to restart the machine were worthy of a performance by Coco the clown, ending with him abandoning his machine in the tall grass and stomping off for good. As an instructional film it had some shortcomings. I suspect it was a “how-not-to-do-it” film. The user manual seemingly had the same origin, a Russian orchard. D-day arrived. Kitted out in sturdy boots, thick gloves, jeans, harness, ear mufflers and face shield I filled the petrol tank with the correct oil/petrol mixture, carefully wiping off excess petrol, and then moved at least 20 feet away from the “filling area”, as prescribed. First I pumped the transparent fuel pump a few times until I could see the fuel bubbles, pulled up the choke and, with my hands in the right position, pulled the starting handle several times in quick succession until the engine coughed and almost started. Down with the choke, and the engine died again. Two quick pulls on the starting handle and the engine roared into life. “Eureka”, I shouted, almost falling over in shock. It worked. I lifted up the machine and hooked it onto the harness, albeit after some fumbling with my thick gloves. Assuming the correct stance, I grasped the controls, pressed in the dead-man’s grip and then squeezed the gas pedal. It burst into action, the grass-cutting head spinning at an alarming rate as I looked round for some grass to cut. According to reliable sources, the engine was loud. Some pheasants flew squawking over the fence into the neighbour, the dog ran into the cottage and hid under the bed, while Mary took a long walk. I could hardly hear anything, thanks to my mufflers. After half an hour or so I cut the gas and released the dead-man’s grip before pressing the “STOP” button. The engine slowed down with a grateful whine, but the blade carried on spinning for a minute or two, slower and slower. Relieved I unhooked the machine and removed mufflers, harness and the rest. The machine left me with fingers still shaking and ears wet with sweat. My first grass-cutting session over, I surveyed the results. Grass, ferns and flowers plus a couple of unknown bushes lay in one great tangle of vegetation. All in all a good job. But it doesn’t end there. The manual concludes with a twenty one item maintenance schedule for daily, weekly or monthly maintenance. With the scythe I simply wipe off the blade with an old rag and hang it up on its nail in the shed. At the end of the cutting season I wipe it over with oil to protect it from rust over the winter. 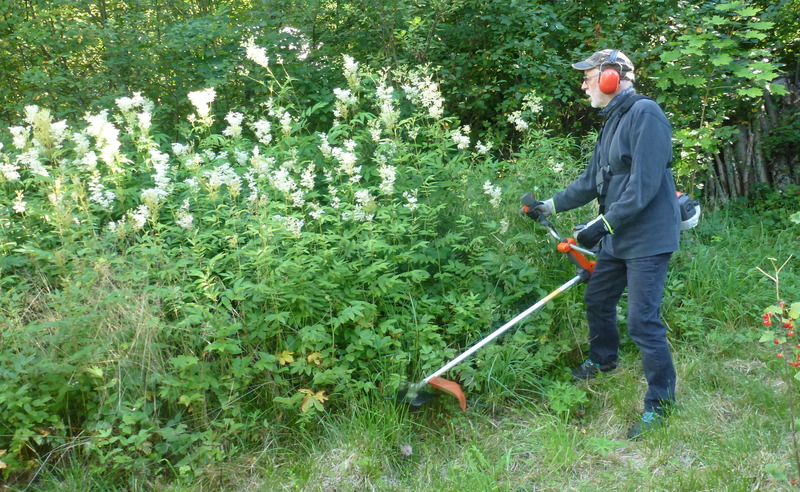 Cutting grass with a machine is faster than with a scythe – but, sadly, noisy and lonely. With the machine, I must focus on one thing – the machine, and not injuring anyone. It is definitely too fast and violent to avoid chopping up the wild red strawberries hiding in the grass. I miss the silence of the scythe, I miss the birdsong and the sound of the slow waves as they reach the shore. Working with the scythe I can meditate, contemplate, allow my thoughts to wander, and I get to eat more strawberries. Is the new machine a sign of progress? My answer is no – and the dog agrees. Eric–A Classic! May I re-post this in one of my blogs? What a nice description of the area and why new things are hard to get used too. I too like to use some of the old stuff. Good story Eric. Jerry O.